October 2013 • Gutters & Guards, Inc.Gutters & Guards, Inc. Comments Off on Reusing Old Gutters! 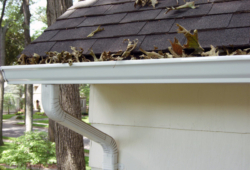 Are you planning on replacing your gutters soon? Instead of chucking them into the garbage, Reusing Old Gutters! There are a lot of ways that you can reuse them. We’ve compiled a list of the most interesting or useful ways to reuse them. 1. Planters – One of the more common ways to reuse them. Whether your want to plant flowers, fruit or herbs. It’s a fantastic was to lift it off the ground or if you have limited backyard (or no backyard) space. Learn how to make a hanging planter with this. Or on a wall from Lowes. 2. Shelves – So many possibilities with this one! A book shelf, Crafts, shoes, cleaning supplies, and it’s a really simple installation. You could use it as a reading nook, craft supplies, to dry off wet shoes, or to hold cleaning supplies in a closet or cabinet. Get the step-by-step guide. 3. Easel – if your kids love to paint and you hate the mess that comes along with it. Why not try this handy idea? Using plexiglass as the canvas and the gutters to hold all of the tools. Great Ideas. 4. Picnic Drink Container – This is a great idea that you can either buy or DIY. Perfect for family BBQ. You could also add individual cup holders so you can put your opened drinks there too. Add some cool to your table. 5. Sandbox – If you have a sand box attaching your gutter to it would be a great idea so your children could either build castles or have matchbox car races. Their possibilities are as endless as their imagination. Here’s a cute idea for your kids. Who knew that there were so many ways to reuse your gutters! 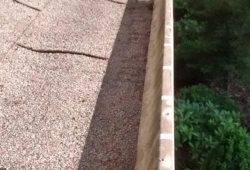 If reusing your gutters isn’t your style then we do offer to recycle them after we replace them. Just give us a call at (855) 2 -NO CLOG or send us a message. All photos courtesy of Pinterest. Follow links to see tutorials of each item. Are you someone who likes to add that little bit of flair to whatever they do? Or maybe you just enjoy having your personal touch in whatever you do. Give your home a downspout a makeover that can increase your curb appeal and help you take care of your garden in the spring and get rid of blockage in the winter. You’re probably wondering what could do all of these things. Well let me tell you about Rain Chains. What are they you ask? Rain Chains are chains that hang from your gutters where the downspout is, instead of the downspout. Rain Chains originated in Japanese culture more than a 100 years ago. They were used for the practice of Feng Shui and to conserve water for gardening. They have in recent years become more popular with homeowners, they are not the most common product that you see on houses but they sure do get noticed. We’re going to give you 5 reasons that you should try them out and you can be the judge on whether or not you want to give them a try. Adds a lot of curb appeal to your home. Every one wants their home to have curb appeal. It’s almost guaranteed with a rain chain. There are so many possibilities with them. You can go from stones to buckets to specificity made ones. Personal Enjoyment. This is mainly for the nice sound they give off when it rains. If you enjoy sitting on your porch during a summer rain storm. It also moves in the wind and is like a wind chime. Reuse rain water for garden. This is what it was originally created for. You can get a basin and collect the water to reuse for your garden or place your plants underneath it during a rain shower. Easy to Install. The installation of this product is simple. If you buy it online it usually comes with an installation kit. But you can buy the supplies you need at any home improvement store. No blockage in gutters. 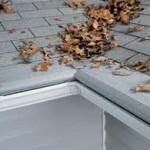 Since the space is not enclosed the blockage that you’d get with traditional downspout is eliminated. Also ice blockage isn’t possible, and the ice that does freeze on your rain chain is frozen into beautiful intricate designs. 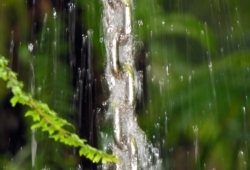 Source Things to remember: Rain Chains are not like a downspout which lead the water to a certain spot. You need to put a basin or some kind of water catcher so your foundation won’t receive any damage. Also it’s smarter to leave some of your downspout on the house. Either opt for the front of the house or backyard downspout to be replaced. That way you and/or neighbors ( depending where you choose to place them) can enjoy their beauty. No matter if this is your style or not. 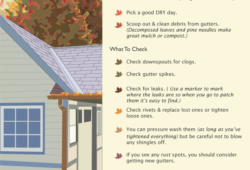 Gutters are important for our home. It is a question of what you want your home to look like.